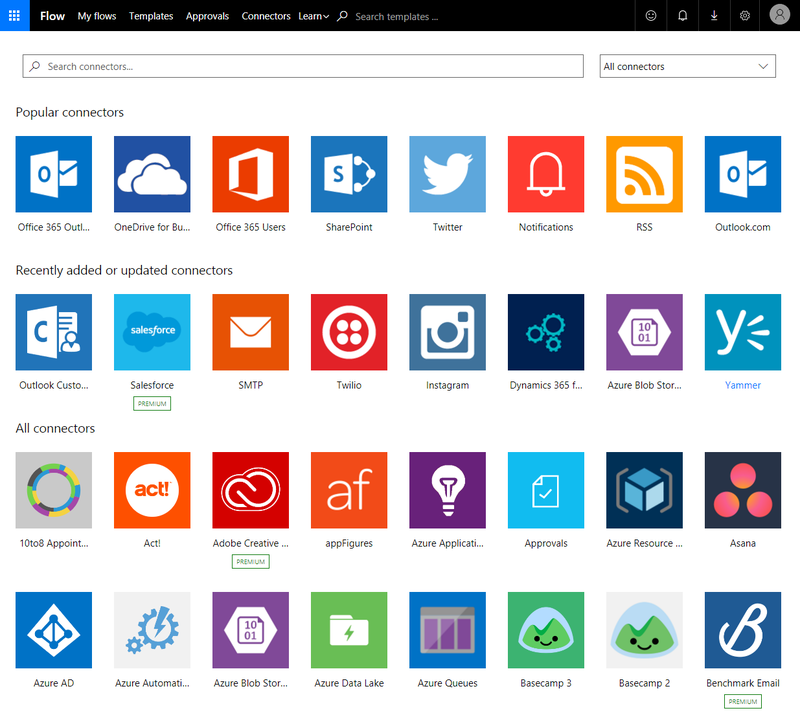 Previously, Microsoft Flow would automatically pick up your region and language settings from your browser. 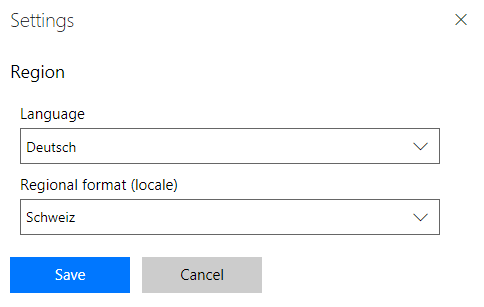 Now you can customize both the Language and Region that Microsoft Flow uses through the Settings menu. Once you go to the gear and select Settings, you can choose from the available regions and then click save. The portal will be reloaded with your new options. Adobe Creative Cloud – Connect to Adobe Creative Cloud to manage your assets. 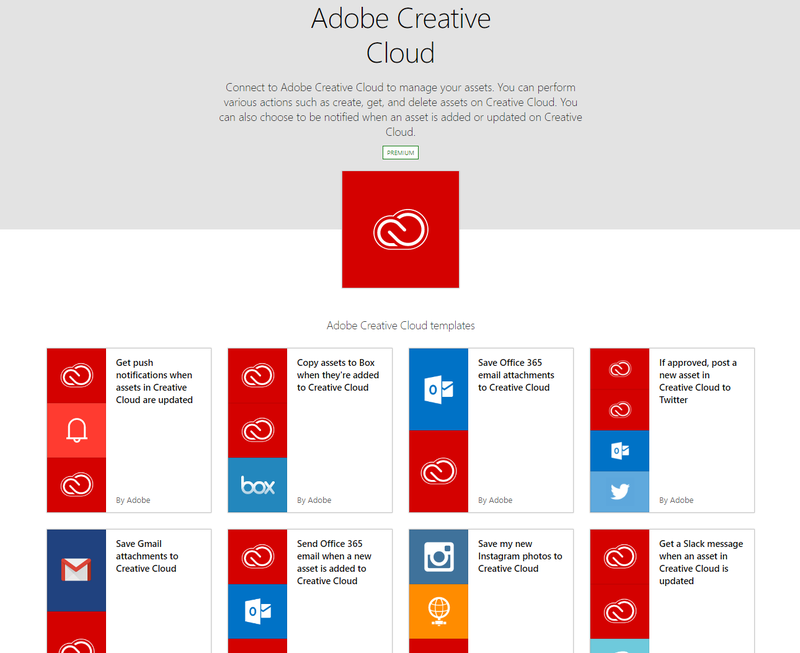 You can perform various actions such as create, get, and delete assets on Creative Cloud. You can also choose to be notified when an asset is added or updated on Creative Cloud. Bing Maps – Bing Maps API allows you to generate map images, routes between two locations or get the specific geocoordinates for an address. You will need to get an API key. Bing Search – Bing Search API allows you to search content across the web. You will need to get an API key. JotForm – JotForm is an online form service used to generate leads, distribute surveys, collect payments and more. Freshservice – Freshservice is a cloud-based IT service desk and service management solution that's easy to set up and use, to transform employee experience across the organization. There are some operations, such as Approvals, that can run for a very long time. You may want to change how long the action runs before it "times out" and the flow continues. For example, if you have an Approval flow and you want to have some specific escalation after seven days pass. This is now possible by going to the "…" menu for actions and selecting the new Settings option. Inside settings, you can enter an ISO timespan that represents how long that operation should last. You can then use the new Run after settings to configure certain actions to run after an action times out. Normally, a timeout is considered a failure, so if you do not explictly have the action run after a time out, then the next steps will be skipped. You can now specify a brand color for the Custom Connectors that you build – so they can look just like the built-in connectors. Previously, you could only Save As… flows in you My Flows list. Starting this week you can also Save As… Team Flows. 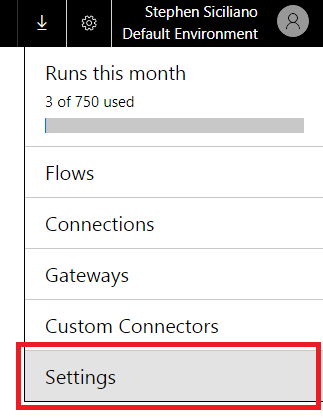 However, when you save a Team Flow you may need to provide additional connections since you cannot use connections contributed by others in flows you create. Also note, Save As… does not copy the permissions, so you may want to re-share the flow. When you delete a flow, we will now show you a list of all of the ongoing runs for a flow. This is important because when you delete a flow any ongoing runs will be cancelled – which can leave your data in an unexpected state. On the Connectors page you can now search and filter by Premium or Standard connectors. We even show the connectors that have recently been updated.